・NEW! Convenient, easy-access format is organized by organ systems, and divides the content into two compact volumes with the same authoritative coverage. ・Nearly 200 new color photographs and line drawings are included in this edition. ・NEW full-color design improves navigation, clarifies subject headings, and includes more boxes, tables, and charts for faster reference. ・New Diseases Primarily Affecting the Reproductive System chapter is added. ・Updated and expanded chapter on pharmacotherapy lists therapeutic interventions and offers treatment boxes and principles of antibiotic use. ・Expanded sections on herd health include biosecurity and infection control, and valuable Strength of Evidence boxes. 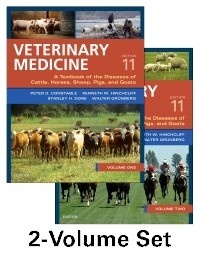 ・NEW or extensively revised sections include topics such as the Schmallenberg and Bluetongue viral epidemics of ruminants in Europe, Wesselbron disease in cattle, hypokalemia in adult cattle, equine multinodular pulmonary fibrosis, Hendra virus infection, porcine reproductive and respiratory syndrome, torque teno virus, and numerous recently identified congenital and inherited disorders of large animals. ・Additional content is provided on lameness in cattle and the diseases of cervids. ・Comprehensive coverage includes information essential to any large-animal veterinarian, especially those working with horses, cattle, sheep, goats, or pigs. ・Coverage of diseases addresses major large-animal diseases of all countries, including foreign animal and emerging diseases. ・User-friendly format makes it easier to quickly absorb key information. ・Quick review/synopsis sections make important information on complex diseases easy to find.